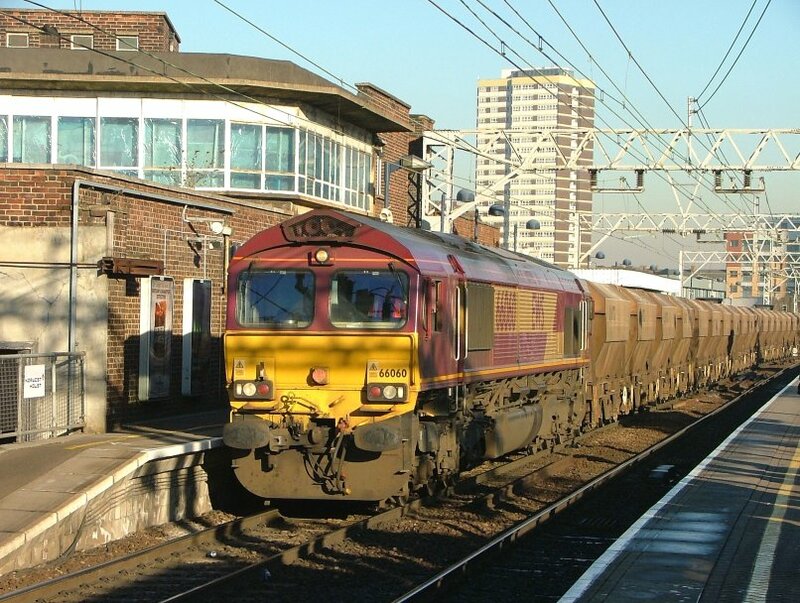 EWS Class 66 - 66060 passes through Newcraighall Station at the head of the 6M85 13:08 Bathgate - Washwood Heath 'Empty Cartics' on Tue 6th Mar 2007 at 14:55. 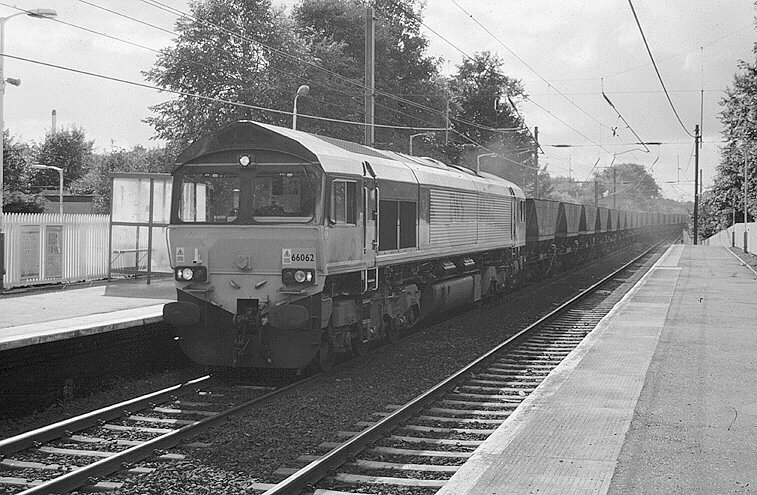 66062 passes through Slateford, Edinburgh with the 6E25 Mossend - Drax loaded coal train on Tuesday 21st September 1999. 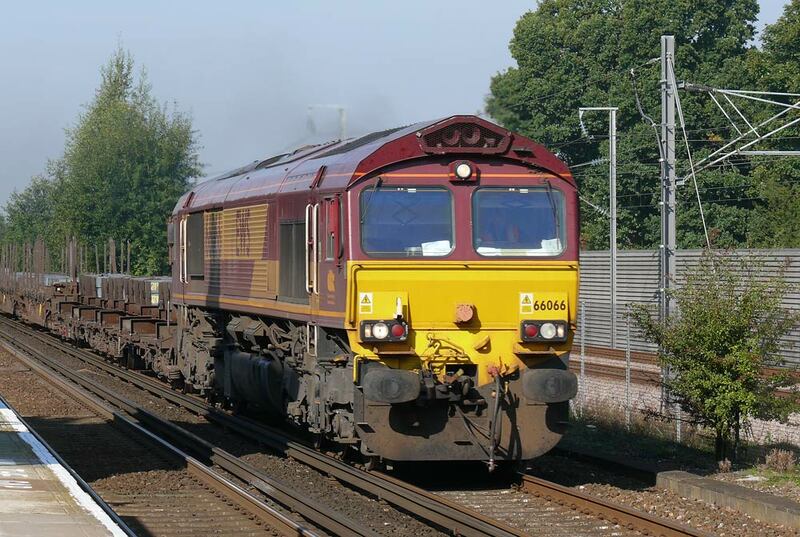 EWS 66064 seen passing Nuneaton on the WCML at MP 97 with a 30-car rake of empty auto-carriers. 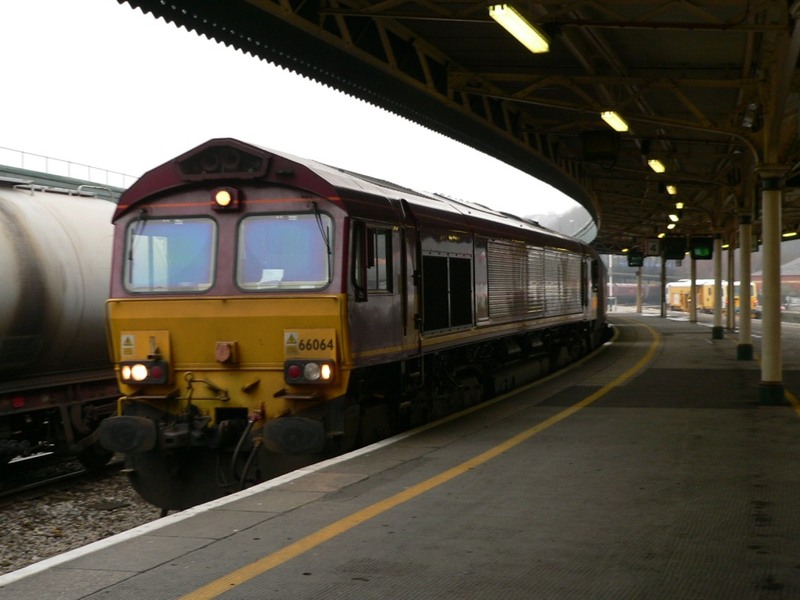 This is a very long train as far as British Rail is concerned. 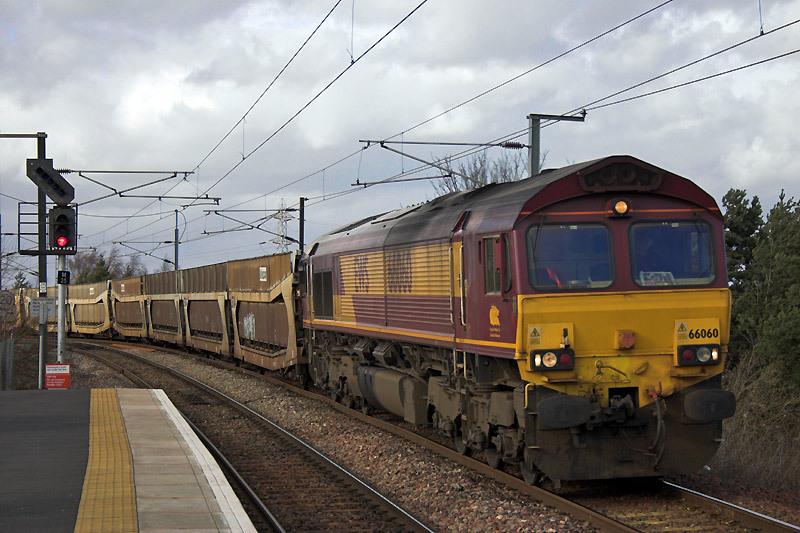 North American railroads regularly run trains up to four times the length. 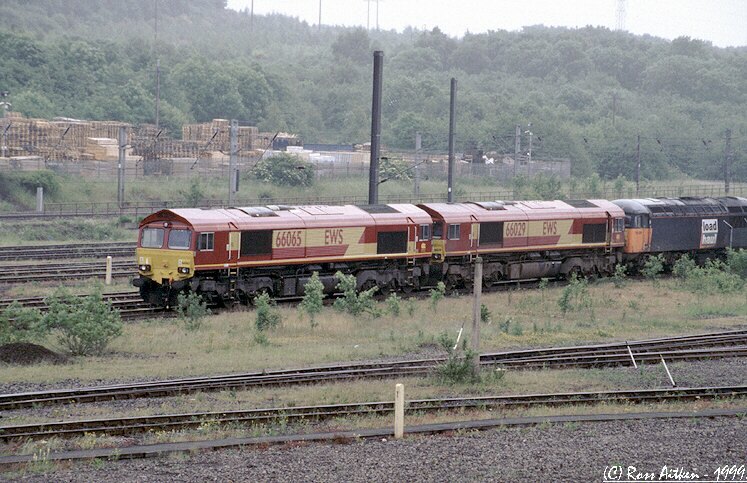 66065 & 66029 stand at Tyne yard on Fri 11th June 1999. 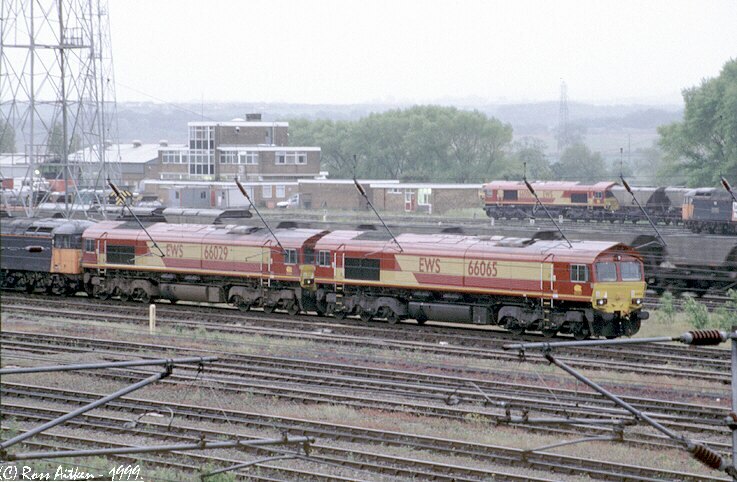 66065 & 66029 stand at Tyne yard while 66088 can be seen in the background with a coal train on Fri 11th June 1999. 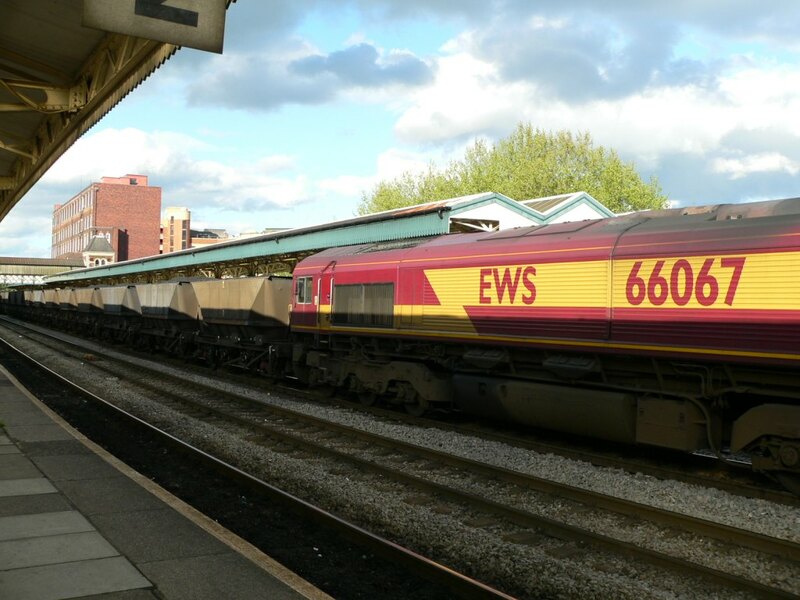 EWS Class 66 diesel locomotive 66067 hauls an eastbound coal train through Newport station in South Wales. 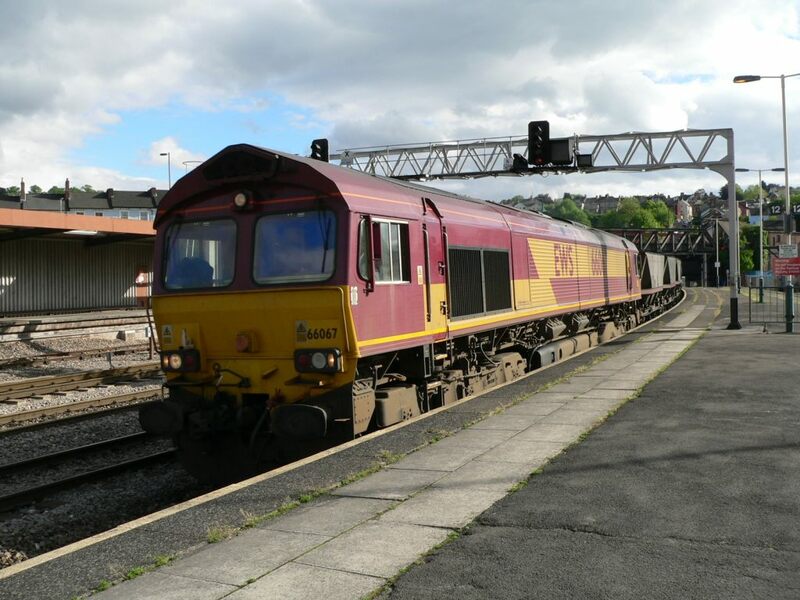 EWS Class 66 diesel locomotive 66067 hauls a westbound coal train through Newport station in South Wales. 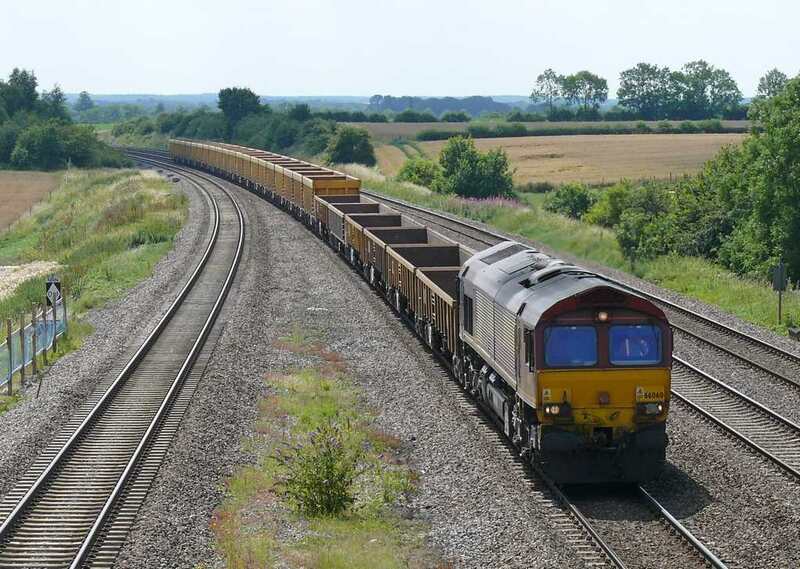 I'm not certain what the reason for this movement is as the majority of coal traffic on the South Wales line is coal being transported from the South Wales coal field to destinations in England - principally Didcot Power Station. 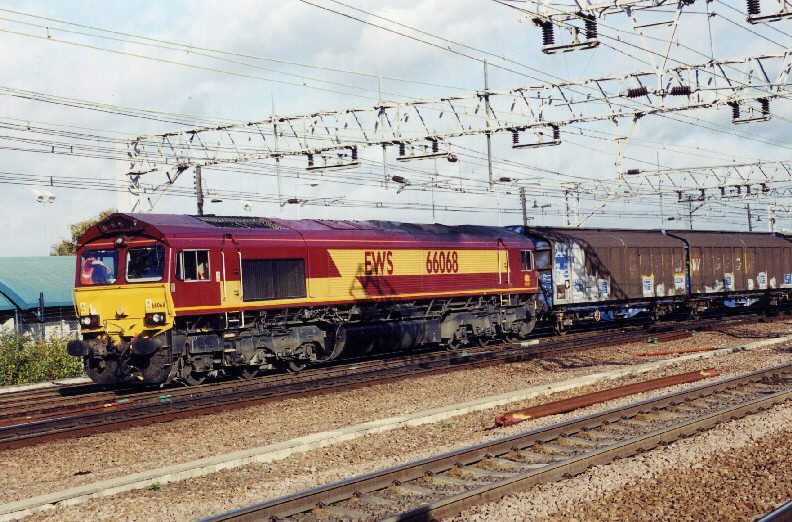 66067 stands next to 56076 at Worksop depot on Sunday 17th October 1999. 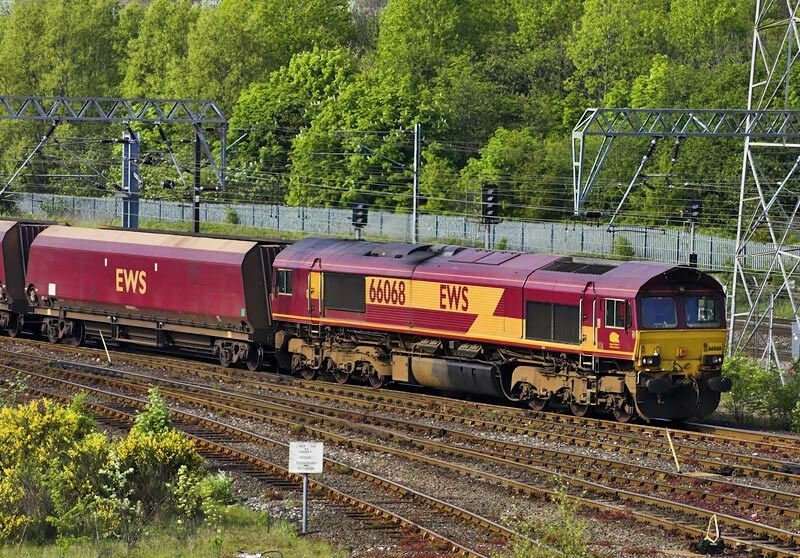 EWS Class 66, 66068, runs into Tyne Yard with an unidentified empty coal working on Sat 5th May 2007 at 16:36. 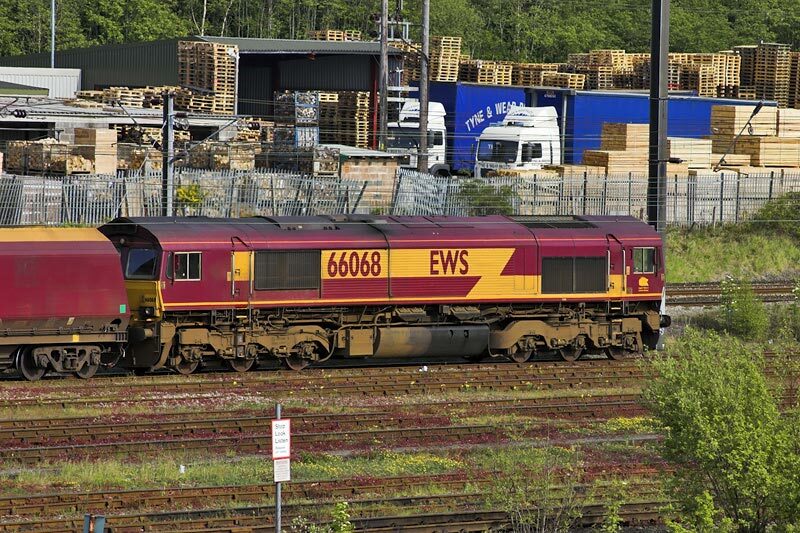 EWS Class 66, 66068, runs into Tyne Yard with an unidentified empty coal working on Sat 5th May 2007 at 16:37. 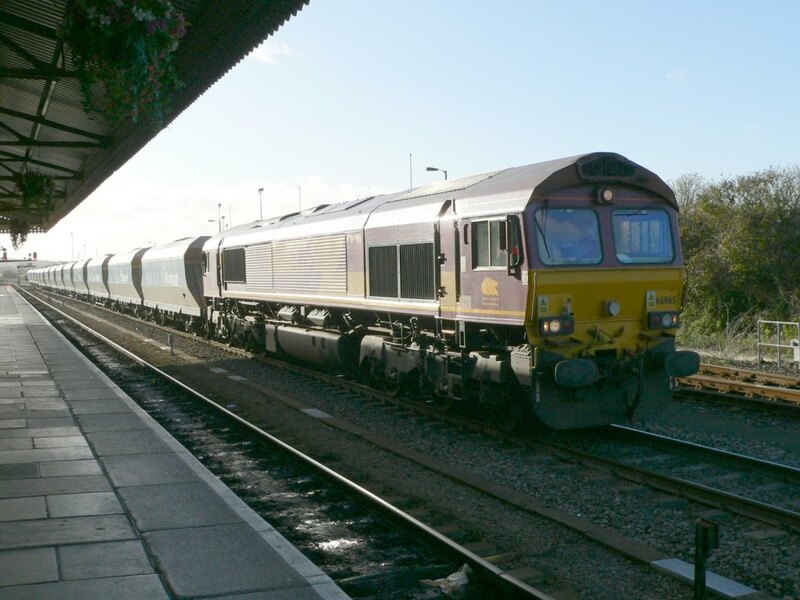 66068 is on the paper train empties that will go to Dollands Moor before changing over to a class 92 for the trip through the Channel Tunnel. 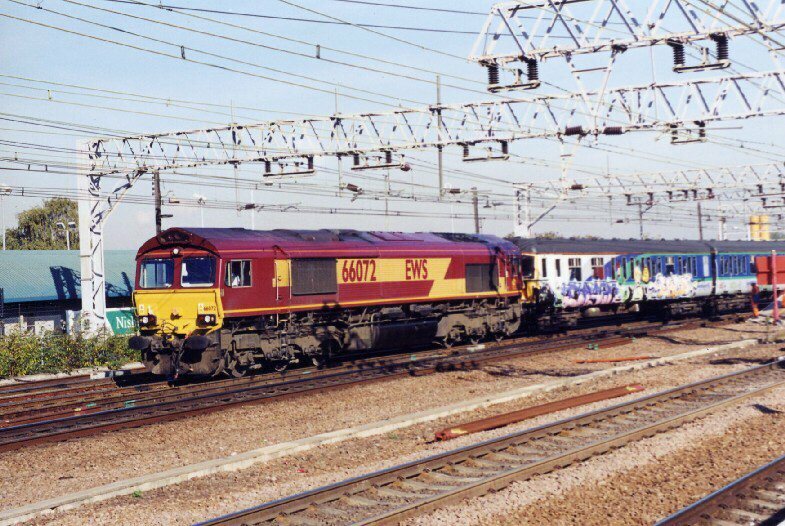 Date November 3rd 2003 at Stratford. 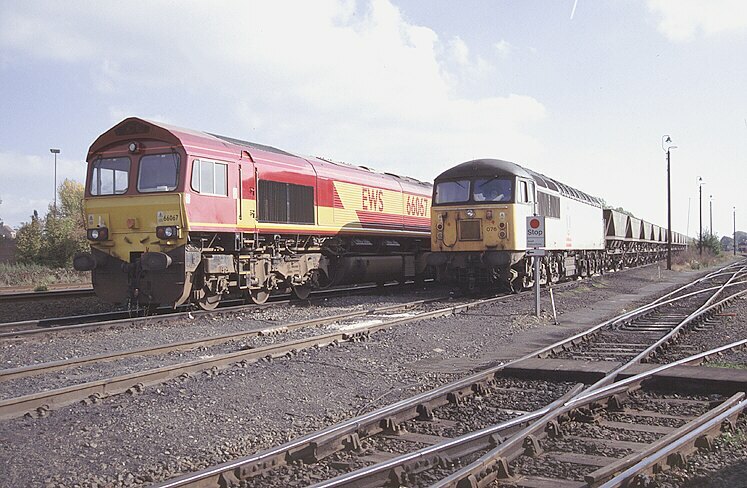 As Class 312s are being withdrawn from service they are moved for storing. 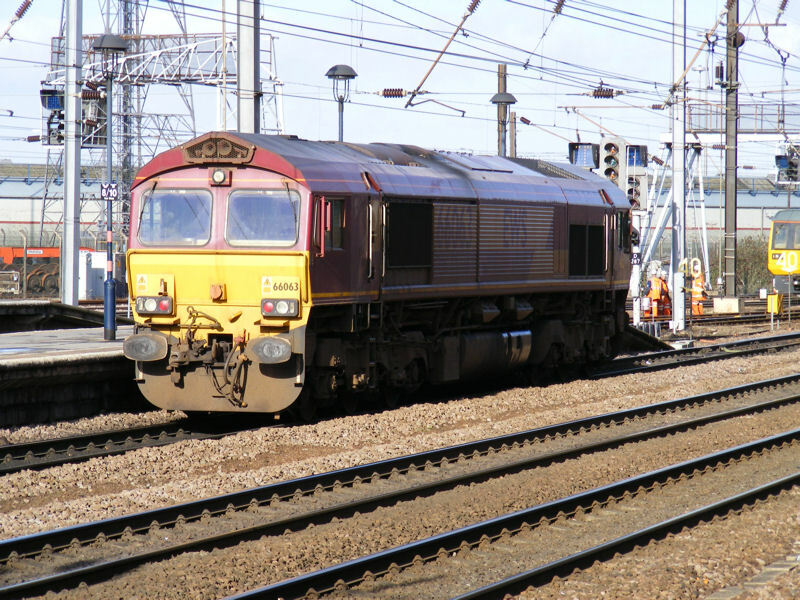 66072 is seen on its journey taking 3 four car units to Wales going through Stratford E.London on the 27th October 2003. 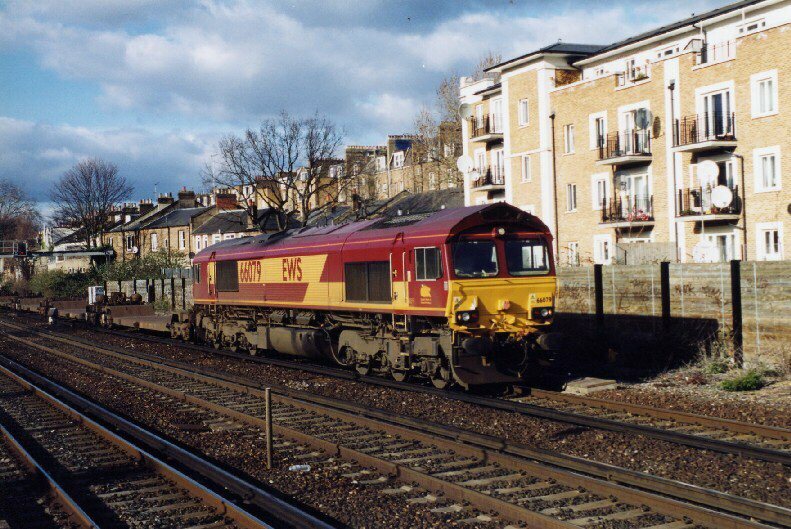 66079 is lit nicely by the sun as it brings its train through Kensington Olympia on the 19th February 2004. 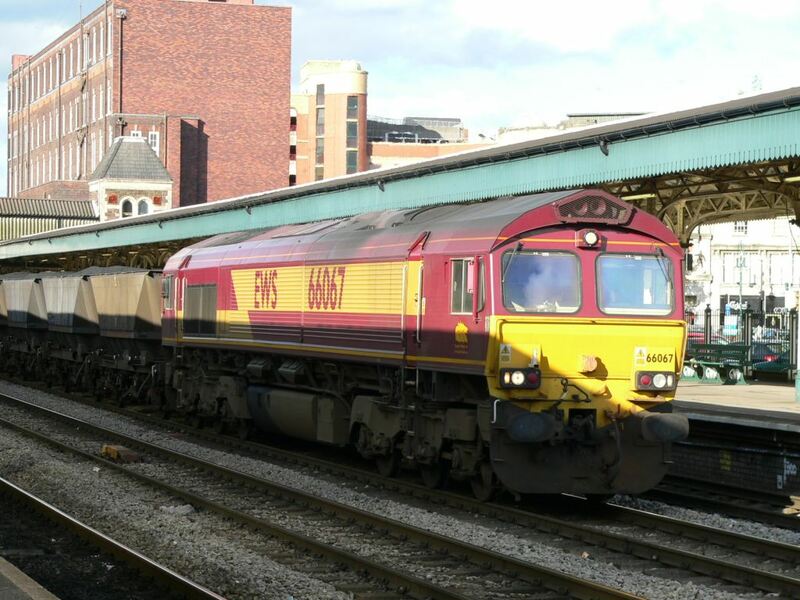 EWS Class 66 diesel locomotive 66064 hauls a long load of covered hopper wagons northbound through Bristol Temple Meads. 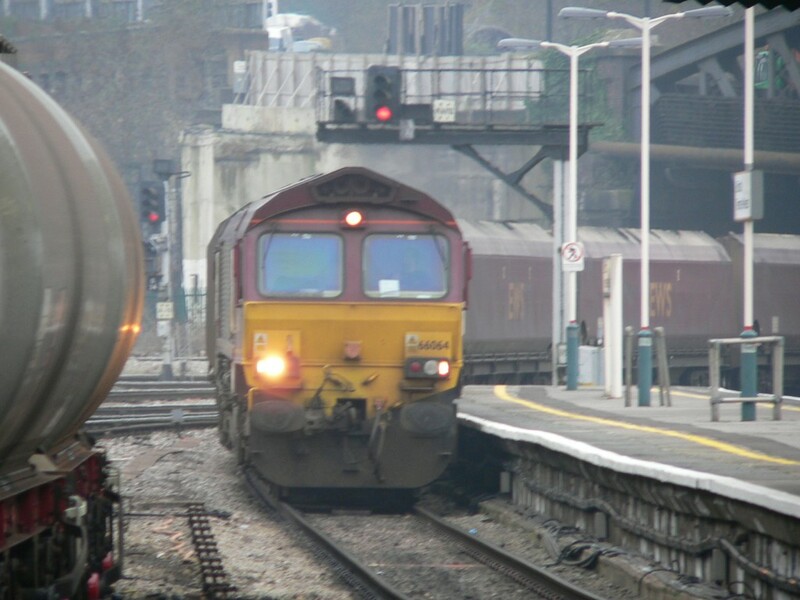 On the left of the picture is a tanker wagon that is part of a southbound freight service hauled by EWS Class 66 locomotive 66181 that was detained at a red signal for the entire time (about an hour and half) I was at the station. 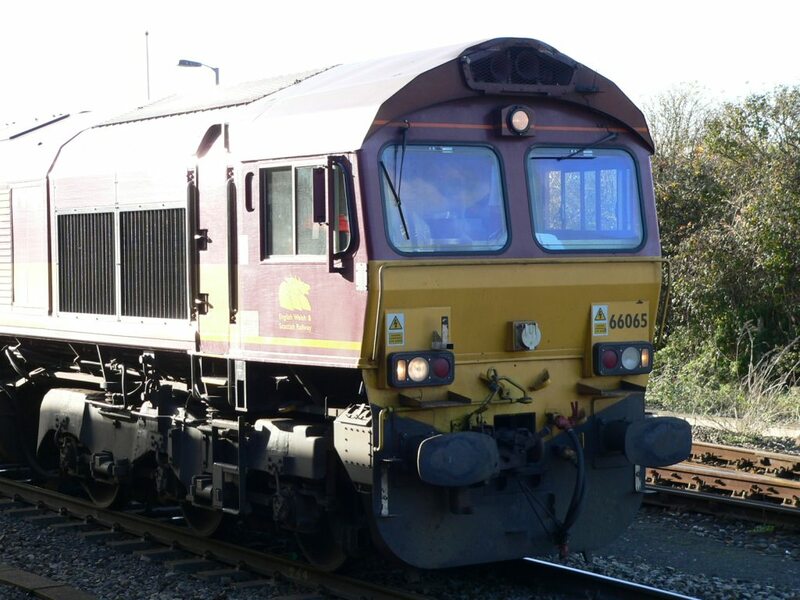 A merged view of EWS Class 66 diesel locomotive 66065 at Westbury station in Wiltshire with an aggregate train. 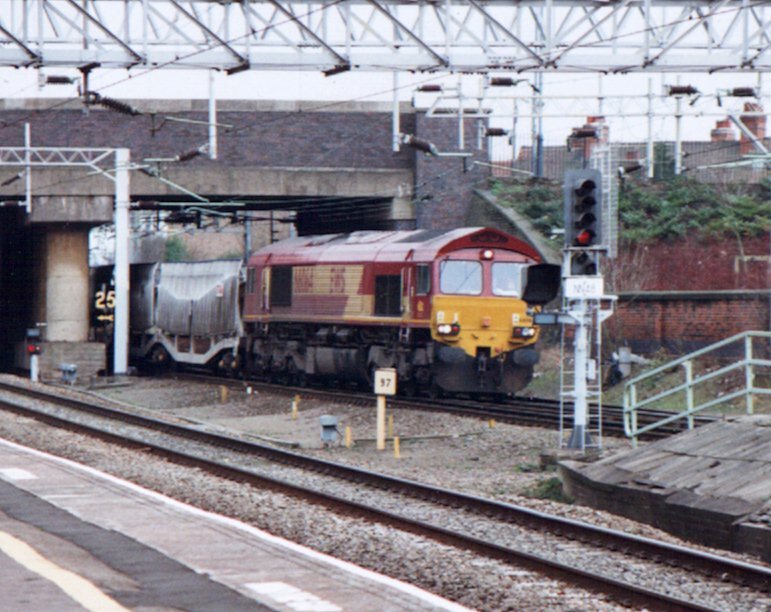 Photo by Chris McKenna 23/11/2006. HISTORY. Pictures like this will soon become history as between Xmas and New Year the buildings on the left will be knocked down as part of a �100M Stratford Station transformation. 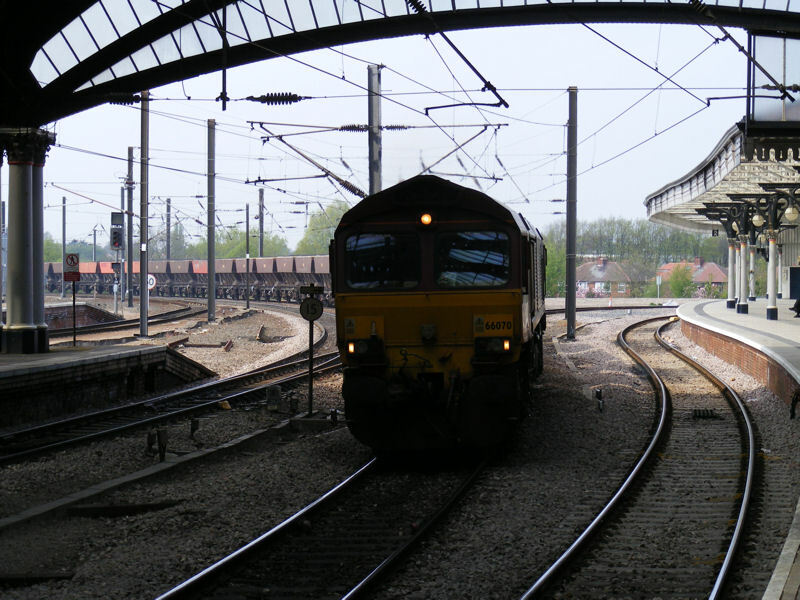 Below the signal cabin is the original entrance to the station which is now sited on the opposite side of the track. 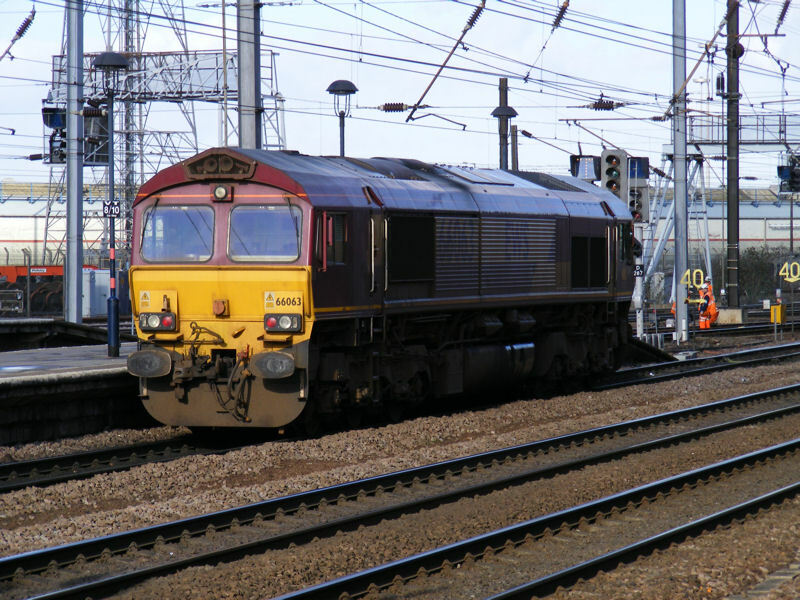 Running through platform 10a is 66060 with a train of hoppers on a sunny but chilly December 12th 2007. 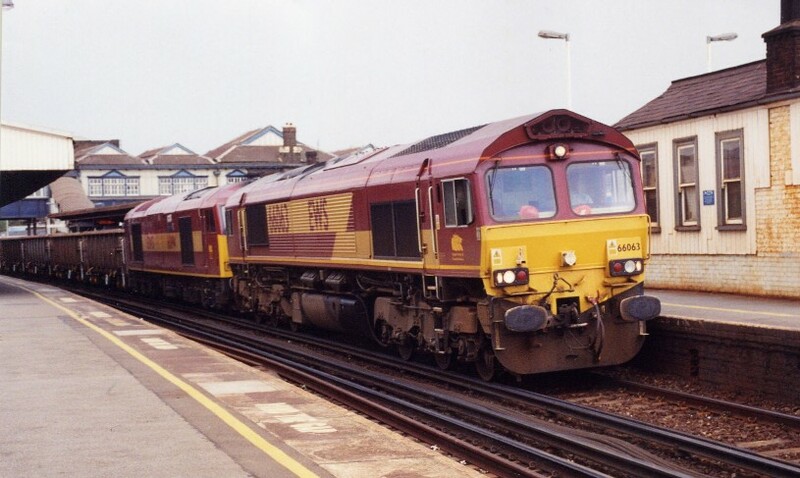 66063 was called in to rescue 60094 which had failed on this engineering train when Pictured at Clapham on the 12th August 2004.